Madness – Multipurpose Responsive Prestashop 1.7 Theme Fashion Furniture Auto & Electronics specially designed for Linegerege, Fashion,Accessories,electronics, computer, digital, fashion, mega store, lighting, autoparts,Auto, vegetables, lingerie, furniture, jewellery, cosmetic and flowers store. Honour Prestashop Theme is looking good with colors combination and layout. All sub pages are customized. It is very nice with its clean and professional look. 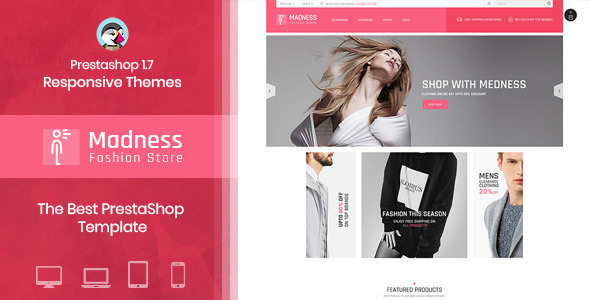 Madness Multipurpose Responsive Prestashop Theme is specially designed for fashion designer store, electronics, Furniture Store, Electronics store, Mobile Store ,Auto Store,Medicine Store and Multipurpose stores. Honour Prestashop Theme is looking good with colors combination and layout. All sub pages are customizable.